We are FULL for this year! We will have a fun and exciting week exploring creatures that live in the garden and beyond. We will create habitats for insects, search for all kinds of critters that are hiding all around, imagine we are pollinators sipping nectar from a giant flower, learn about animal tracks and make tracks from plaster molds, among lots of other fun activities. Our snacks will have a creature theme every day. 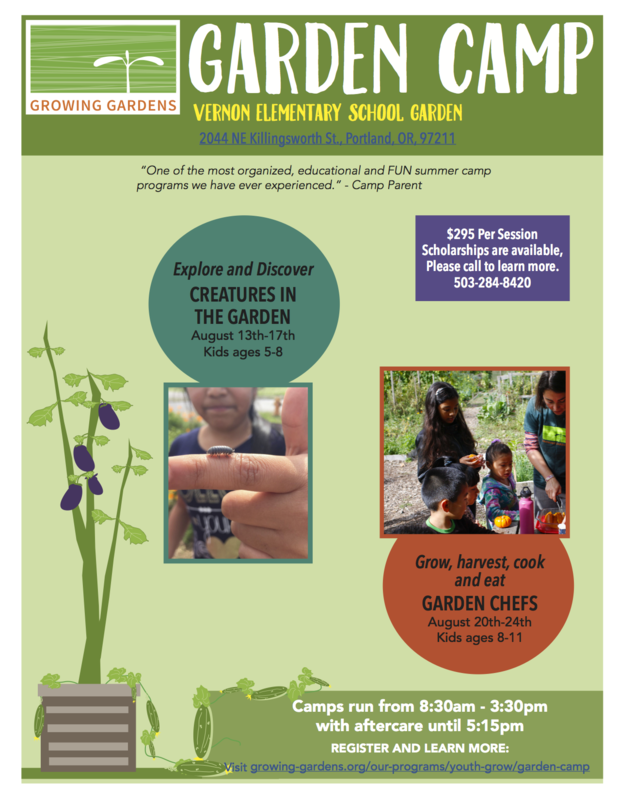 This outdoor cooking camp will use garden fresh produce to create delicious dishes from the garden. We will be using a solar oven and rocket stove. We will also explore the garden’s ecosystem, observing the animals and insects that live in this space. In addition, we will have a craft/art project related to the daily theme based upon food from various cultures and places, such as New Mexican blue corn tamales, Italian bruschetta, Oregon Trail johnny cakes and blueberry cobbler, and Asian Pacific stir fry. Come join us for a culinary adventure in the garden. We are all FULL this year for your summer camps! Please reach out if you are interested for next year 2019! Julie Welch has been a Growing Gardens staff member leading school garden education at Abernethy elementary for the last two years. Julie comes to us after serving the last eight years in the Bay Area as the Sodexo Food Service Garden Manager at Saint Mary’s College of California. She was also a staff member at the Nature Education Program in the Orinda Unified School District, and Nature Activity Coordinator at the Trails to Success summer adventure horse camp. While at Saint Mary’s, Julie taught a course entitled “Radical Homemaking” which emphasized cooking with produce from the garden. Prior to that, Julie spent fourteen years as a middle school special education teacher, all the while wishing she had a greenhouse for her students. She and her husband also helped start a community garden in their neighborhood. Now they are in the Portland area to be closer to family. Julie is thrilled to be part of the Abernethy Garden of Wonders team helping students connect Science, Math and Language Arts with nature through experiential learning in the garden, plus cooking delicious garden inspired creations and harvest of the month dishes.